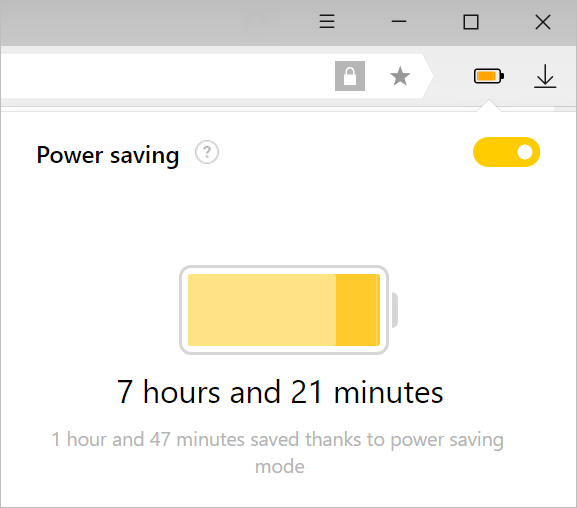 Power saving mode in Yandex Browser saves the battery. You can work almost an hour longer in this mode on battery power. How does power saving mode work? Browsers are the most popular programs today. People use browsers to receive and send email, make purchases online, play games, listen to music, and watch movies. You may open dozens of sites in the browser at the same time, and most of them are probably full-fledged web applications requiring significant memory and power resources. If you are operating your laptop on battery power, the browser load makes it run low on power faster. Reduces activity of the background tabs. Always uses the video card to play video. Reduces the FPS of the pages. Disables animation in browser interface elements if it is too CPU-intensive. Takes other actions to optimize power consumption. To view your laptop's battery charge, click to the right of the SmartBox. Click to the right of SmartBox. In the window that opens, disable the Power saving option. In the Power saving section, disable the Turn on power saving mode option. In the Power saving section, enable the Turn on power saving mode option. Select an option from the list (the browser can turn on the power saving mode when the power cable is disconnected, or if the battery charge is below 80%, 50% or 20%).